Tony wrote: It's that time of year again and the insurance renewal is in. Had a valuation of 120k by JEC so need to see if that affects the cost for this year. Peter Jones ?287 agreed value ?120 - ?250 excess unlimited milage. Waiting call back from Carole Nash to see if they can better. Although it annoys me that they should not quote their best price in the first place. But loyalty means nothing these days. Carole Nash offered me to do it for ?277 with 120k valuation And ?500 excess. Insurance due in June 2017. Couple of question. 1. Is 120k still a good agreed evaluation figure or do I need to review. 2. if I went on a family group insurance and say my wife had an accident, would all the figures rise and would all the no claim figure be effected. It will be interesting to see what Peter Jones renewal figure is. I will keep you updated. Last edited by Tony on Mon Jun 19, 2017 11:40 pm, edited 1 time in total. I've got an S2 and only last night got an agreed value of £125k from the insurers so I suggest you look at your valuation first. My insurance was £280 last year with Heritage on a £80k valuation. That's including 5,000 miles/yr and European recovery. When I increased the value to £125k following restoration/RHD conversion it went up to £411. I'm now tempted to put it on my Admiral multicar policy as it seems others are happy. With the multicar the NCB applies to the person so if your wife has a claim it only affects her. Check their website FAQ's, it makes it clear. The biggest variable in my insurance quotes, year on year, has been the change in the agreed valuation. When my car was under valued, when the market took off and my valuation didn't follow, my preiums were small. For example in one year, recently I paid £50 for unlimited mileage, but a value of £25k. This year's premium was higher as the valuation went up again, in my case to something between the condition 1 and 2 on Hagerty's latest values. The insurance agent was Lancaster, (they are not the actual insurer but an intermediary). Incidentally, for the second year in a row Lancaster have calculated my premium based on a valuation which they have subsequently reduced by £5k. If anyone else has used Lancaster and experienced anything similar in the last two or three years, please PM me. I agree that the valuation is key before starting any negotiations. The E-type club were helpful, but way off understanding that insurance is about the replacement value from a dealer. I now have a V12 Roadster with a factory 6.0 litre fuel injected engine, rebuilt to concours standard by M C Wilkinson, and sold to me by Eagle, with a few enhancements. £135k as a valuation was way off the mark. Even standard concours cars are fetching £165k from the likes of JD, CMC etc. So, if the clubs come up short, and you have bought your car from a highly reputable dealer; use them to give you the replacement value valuation. That's what you do with jewellery.......My insurance is through Peter James. Great to deal with, and under £400 with only a £500 excess and 3k miles a year. Breakdown cover, etc etc. With a valuation of £195k. Having said that, bear in mind values can go down as well as up, relative to the replacement cost. chrisfell wrote: This year's premium was higher as the valuation went up again, in my case to something between the condition 1 and 2 on Hagerty's latest values. The insurance agent was Lancaster, (they are not the actual insurer but an intermediary). I think your car is seriously undervalued. The Hagerty values are way off what cars are going for and don't forget things are dearer this side of the pond. I know what I paid for mine and what I have spent on it. Angus Moss told me what he thought it would be worth after the work carried out and my insurers agreed within 48hrs. Barry's comment are right, it's not what a club or other people think, it's what the market is asking for similar cars. I've insured the car with Peter James, and am being offered a considerable discount (£160 ?) if I'm a member of one of the following four clubs - names may be unreliable as I noted them down at haste ! Jag Owners Club £ ?? Do they sound right, and can anyone give me a quick low-down of any other advantages that might make the reasoning anything other than just chosing the cheapest ? I only own the "E" and am not particularly interested in any other Jaguars. Do "we" on the Forum affiliate more easily with one than the other ? The Forum is affiliated with the E-Type Club (hence the logo and link on the Home page) and you get a monthly glossy magazine dedicated to the E-Type. The others are cross-cultural covering all Jaguar cars. If you want the discount suggest you join the E-Type Club. By the way how did your hoodless dash to South Wales go? Thanks David, yes, I could have worked that out for myself really couldn't I ?! The dash across to Wales was perfect, avoided the drops by going overnight and getting the morning Ouistreham ferry, quick MoT in Portsmouth (can of brake-cleaner on the diff leaks in one bay, then over to another for the inspection) followed by run up to Jack at BAS. Will recount the overall Road Trip elsewhere, but 5.500 uneventful kms later all looks good - especially this shot near Cape Wrath at Sango Sands. I want an agreed valued policy, but I don't belong to any jaguar clubs, nor want to join again. In fact, any of the classic insurers. You don't have to be a club member to get insurance. I got an agreed value policy just by sending photographs of the car to Hagerty and they used their own assessor to agree the value. I've just renewed with them and their recommendation was not to change the agreed value as there hayd been very little movement in prices over the last year. Well another year goes by and my renewal quote from Peter Jones has come in at £374.38 which seems a reasonable increase to allow for inflation etc. My son was put on the car mid term so the new premium includes him also. Maybe at last insurers are not trying to hike up prices now they have to quote last years premiums. I will check a few others but so far Adrian Flux has quoted £550 . I am beginning to think they are a waste of time even asking for a quote as last year they were stupidly high. On my GT6 my renewal was £269 with Lancaster. Shopping around, I ended up back at Lancaster for £134 despite having a claim last summer that was my fault - I couldn't blame the lamp post despite Jasper Carrot's best advice. I have found RH to be the most competetive. Cover provided by Equity Red Star - a Lloyds syndicate. My renewal for the coming year is £325 including IPT and legal protection on £100k value by me, and also including breakdown cover (UK and Europe), salvage in case of total loss, 5000 m/a, £500 excess. I have stated that value but currently the insurer would pay their assessment of "market value". I've requested cost extra for any driver cover...... waiting. Interesting comment above re: agreed valuations. RH requires a "certificate" of valuation, without stating who from. My provider - Splined Hub in Oundle, will do me a valuation letter. So should my valuation be based on what he would charge for an equivalent replacement car? I think it should be based on what YOU think it would cost to replace your car. That may well be what splined hub would charge, but you need to make a reasoned valuation based on your knowledge of your car, the market etc. Or get a view from JDC/JEC if you're a member. I only fit in a 2+2, so got one! I have been with Classicline insurance for a couple of years with my Healey 3000, and now 'laid-up' cover for my E-Type during restoration. They offer a very reasonable unlimited mileage agreed value cover which I will be taking out once it's finished. I feel that a valuation should be based on what it would cost you to go out and buy another, tomorrow, in similar condition to the one being insured. As we know, a fully restored E-Type could cost you anything between 100 - 250K depending on the model and the dealer/restorer/private individual's expectations. You also need to consider auction hammer prices as well. So what I do, is I take a look at a dozen or so examples across the marketplace that I would consider similar spec and condition, and average out their values. If there are one or two that are clearly way more expensive, (data outliers)then I remove those from the equation. Coincidentally, The Splined Hub have rebuilt my engine and will hopefully be re-installing it soon. Renewal time again. Peter James for £497 including taxes, on an agreed value of £195,000. 3k miles a year, and £250 excess, plus overseas recovery. However, Adrian Flux rang me on Friday wanting to give me a quote. Why not, i thought. Dont use them, on the basis they did not understand either the car or classic car insurance. They use Haggerty as a third party insurer, and their quote........£1000.00. 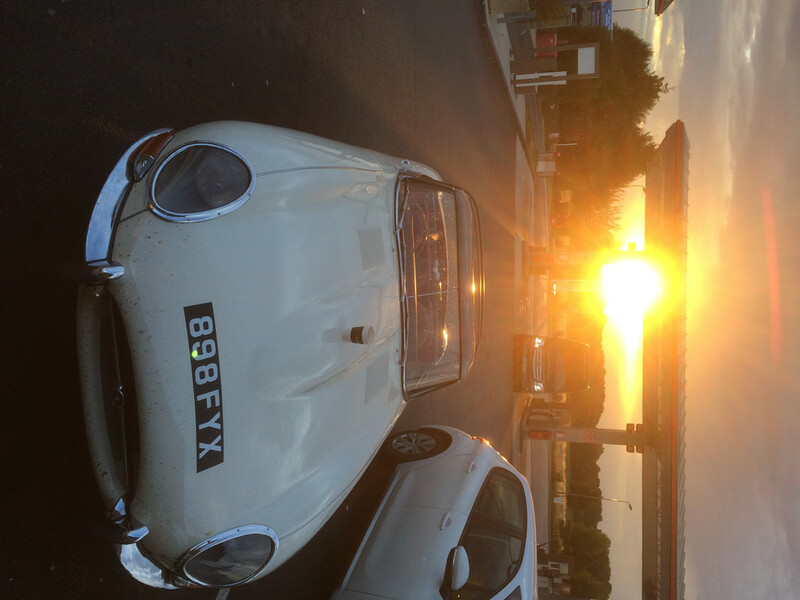 I would always recommend Peter James as they sorted out my first E-type within three days with a full payout after it had been written off by the garage. Wow Barry, that's a hell of a valuation. Forgive me for not knowing what car you have but I assume it's a Series 3 from your avatar. That's well above published values. When I renewed in May I was told Series 1 values hadn't changed in the last year. The explanation is that my car is fitted with the last 6.0 litre engine from the factory when it was restored by M&C Wilkinson. It has AJ6 Engineering inlet manifolds, (TT Torque Plus), fuel injection, special exhaust, uprated suspension, brakes etc etc and 16” x 7” wires with 235 / 60 x 16 tyres. Standard rebuilt gearbox with 2.88 lsd diff. It was sold via Eagle who have added their mods and given it their provenance. It is also 100% concours, with a totally refurbished interior. Valuation agreed at £195k. Easy to understand when top standard V12’s are at about £165k. Mine is quite unique. The insurance through Peter James i think is quite reasonable considering.